Have they dropped the "Wreck-It Ralph 2" part from the title? The last two tweets from the official page for the film don't feature it in the logo. ^They finally came to their senses. I wonder how they ever thought such a long title was a good idea. Two untitled live-action Disney movies have been removed from the schedule entirely. I wonder which two films have been removed from the schedule. Have they been moved to the streaming service? 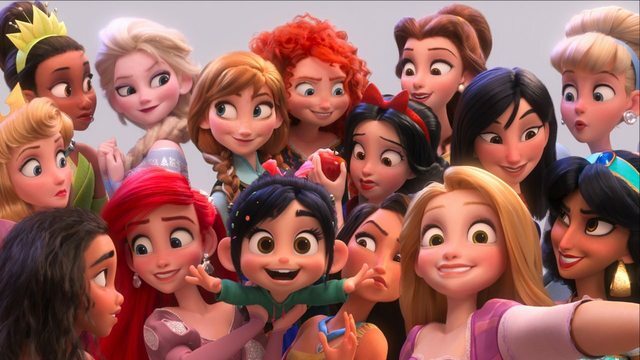 The promotional selfie pic of the princesses uncropped and in higher quality. Thanks! I love it so much. I'm going to guess that this will be a full animation for the promos and this is a screenshot of it. I know "The One and Only Ivan" is currently filming, but Disney hasn't officially put it on the schedule yet. Unless they're saving it for 2020, that might be one of the films. ^Yes, that could be one of them. Why would it be meant to be taken seriously? These aren't documentaries or adaptations of the Bible. Its not really much different from Hercules. I don't know, some people might think something new they invent God saying should be taken seriously. And you think of God like the Greek gods in Hercules?! I actually prefer Wi-Fi Ralph as well. It's more reminiscent of the original title although this film doesn't seem to have much to do with the original so Ralph Breaks the Internet is probably more appropriate. I don't find this to be true at all. Ask any average joe or jane their favorite disney movie, Lion King is usually their pick. Alright, fair enough. You're right and I apologize my former remark. I don't personally, because the greek God or Gods is different from the christian God I follow, but that's the point. I know its, A, just a movie, and B not meant to be from my religion in the first place. I did however know of someone from my church who frowned on the idea because he worried it would confuse his (christian) daughter. It was particularly the idea of multiple Gods that they touch on a bit. False doctrine and such. I think he's come to his senses now, but still. One more month until animation is done. If they did what they did with Hercules with the Christian God, I would be offended and I think you would, too. The difference between Hercules's gods and the Christian ones is people don't believe in Greek gods or mythology as real today. Dark Horse is proud to reveal Disney Ralph Breaks the Internet—Click Start: Choose Your Own Internet Adventure! This new graphic novel serves as a prequel, and bonus short sequel to the feature film Disney Ralph Breaks the Internet. Walt Disney Animation Studios' follow-up to 2012's Wreck-It Ralph leaves the arcade behind, venturing into the expansive universe of the internet—which may or may not survive Ralph's not-so-light touch. In this prequel, a choose-your-own-adventure-style graphic novel, Wreck-It Ralph and Vanellope von Schweetz journey through the internet with you in the lead... Then, in a bonus 8-page short sequel to the film, Vanellope explores the wonders of OhMyDisney.com. So, it's a prequel of the movie when Ralph and Vanellope go to the internet...before Ralph and Vanellope go to the internet? Maybe it's a sort of a midquel? Maybe it's an alternative retelling of the beginning of the sequel? The phrasing is indeed confusing. New Poster, complete with Product Placement. Last edited by DisneyEra on Fri Aug 10, 2018 11:10 pm, edited 1 time in total. That's to be expected considering that the only reason this film was green-lighted in the first place was for that basis.